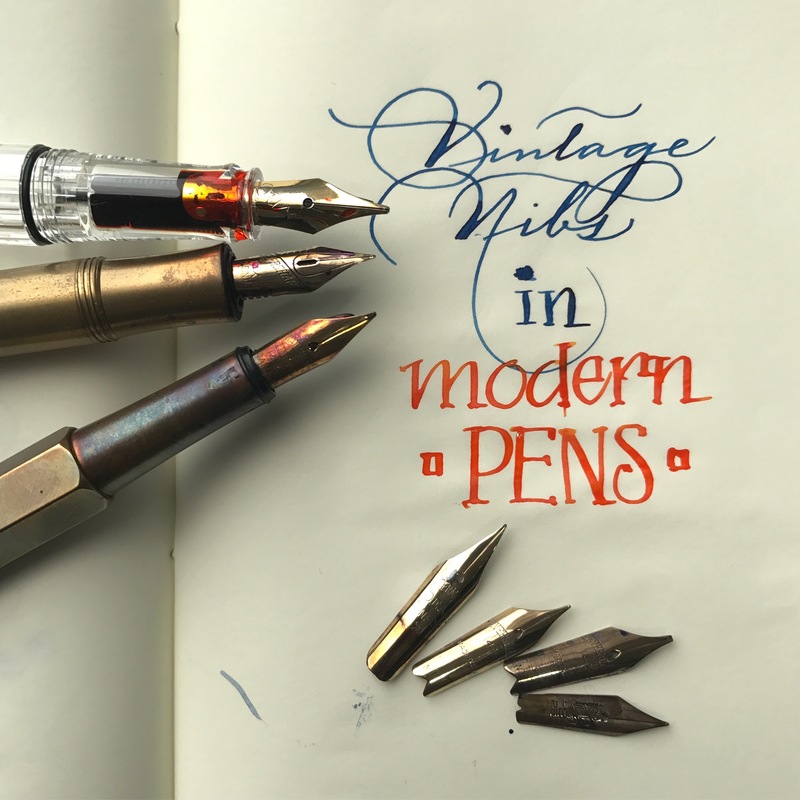 Vintage nibs in modern pens. – Leigh Reyes. My Life As a Verb. 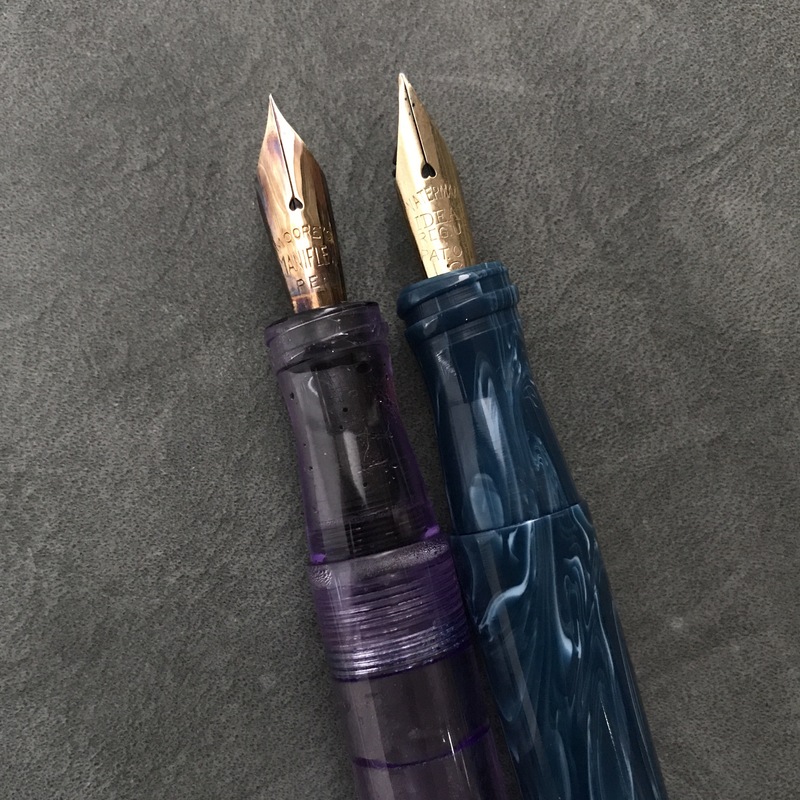 Vintage nibs in modern pens. 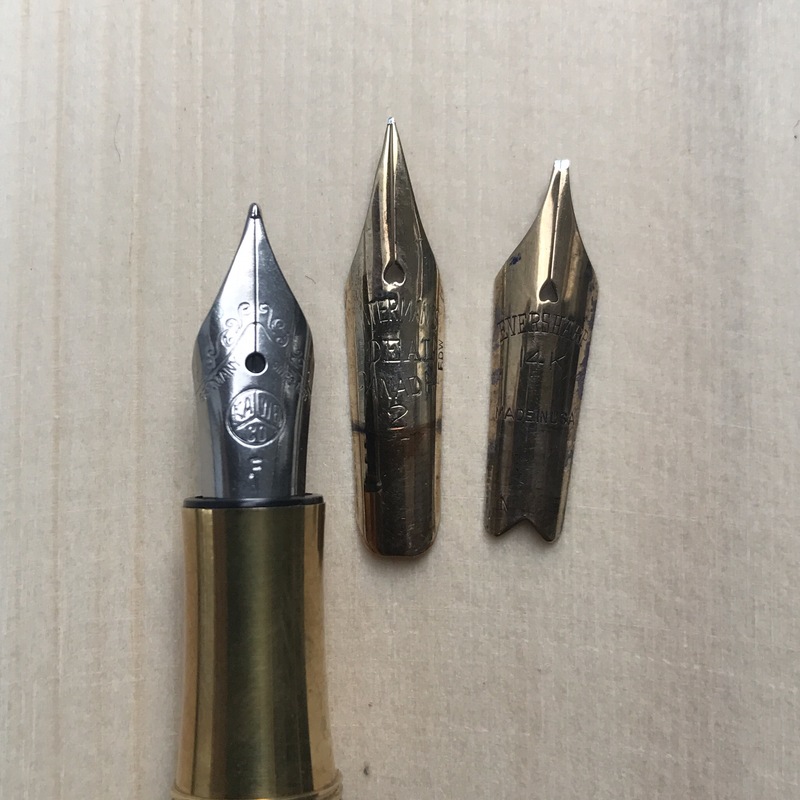 Many vintage nibs outlast their bodies. Hard rubber oxidizes beyond elbow grease and redemption, celluloid combusts, casein warps. Levers come unhinged, piston shafts detach, rubber sacs gooeify – but nibs of noble metal soldier on, a long way yet from the Great Parts Bin in the Sky. I will preserve the entire vintage pen as much as I can, and have done so. There is much joy in writing with a pen that wears its decades well. 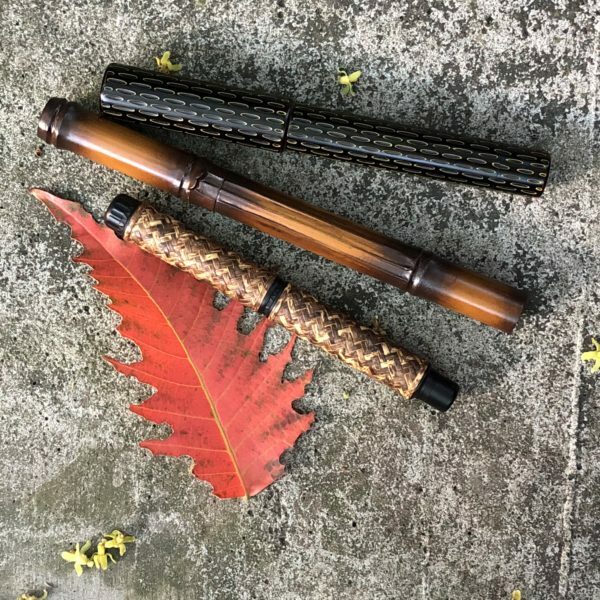 I do worry about carrying vintage pens around; the heat, humidity, and omnipresent dust and dirt can’t be good for vintage materials that were never meant for this environment. 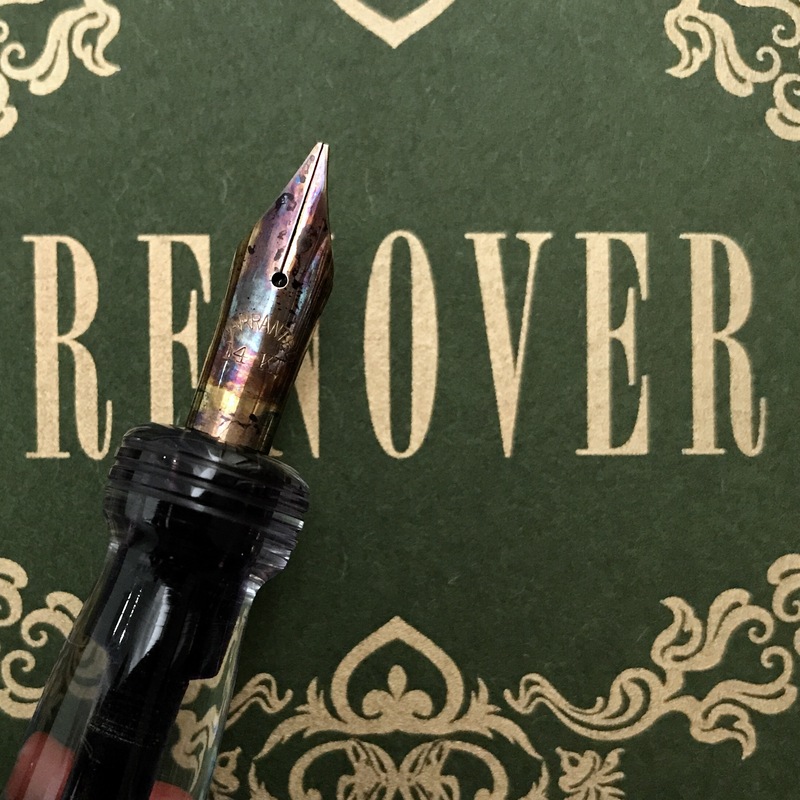 Several years ago, I transplanted an Eversharp Skyline nib into a TWSBI. That nib has moved on to another pen; the TWSBI barrel eventually developed a crack (yes, I know they will replace it if I ask). But see? That nib has now survived two pens. And so, vintage nibs in modern pens. There’s nothing quite like a vintage nib. 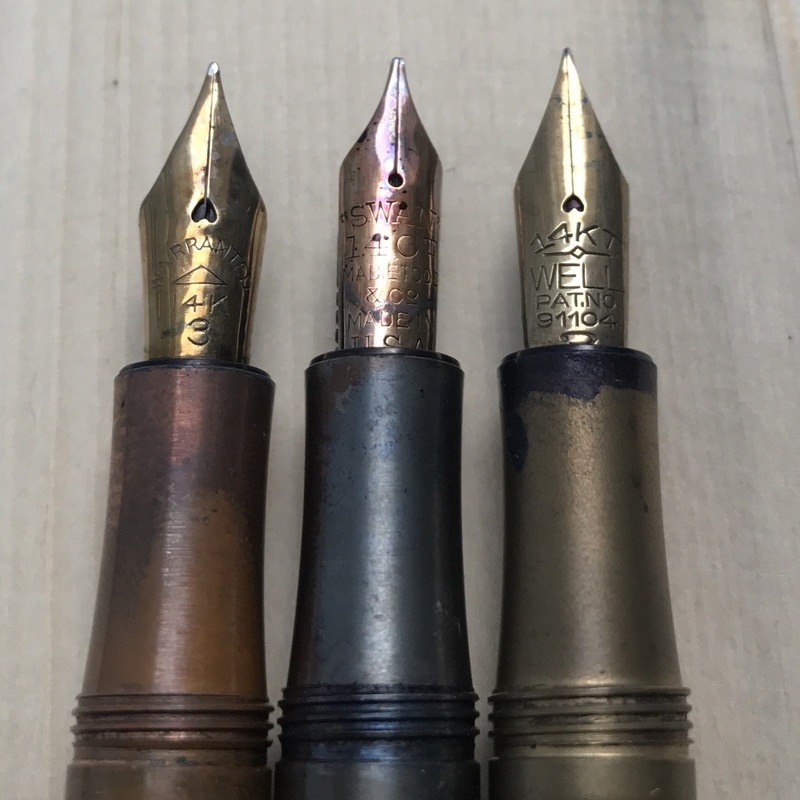 Not all vintage nibs are flexible, but the best flexible nibs are vintage. Even the nails (I’m looking at you, Sheaffer) feel responsive and almost supple, iridium connecting to paper just so. 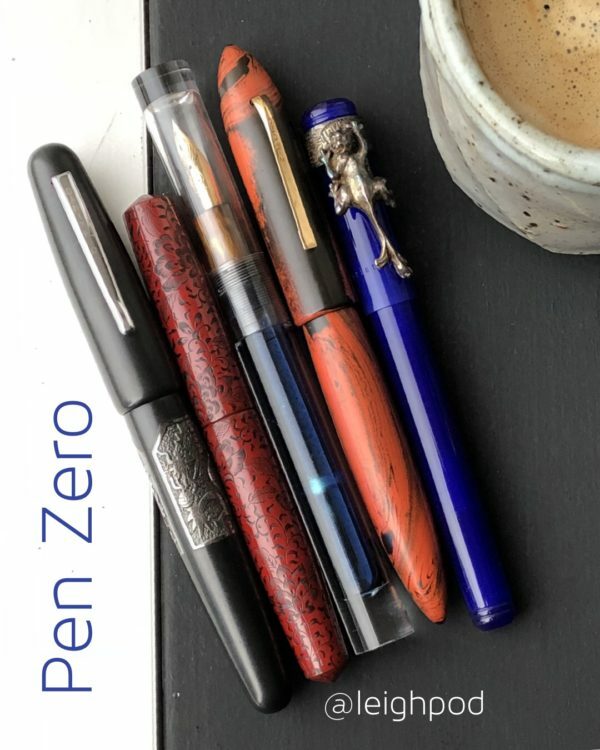 The hottest Kickstarter pen projects claim innovation, and they do look appealing. But then the nibs are regular JoWo or Bock, or Schmidt, and the appeal is all about what you hold, which to me misses the point. I admit my needs are not merely daily writing. I look for line variation because doodling is my preferred survival mechanism; meetings would be more endless than they already are without the swirls and scrolls and the occasional ink-blot-turned-flower framing my notes. Others might simply find the sameness of the stock nibs tolerable at best and off-putting at worst. Certainly there is no lack of custom grinds. 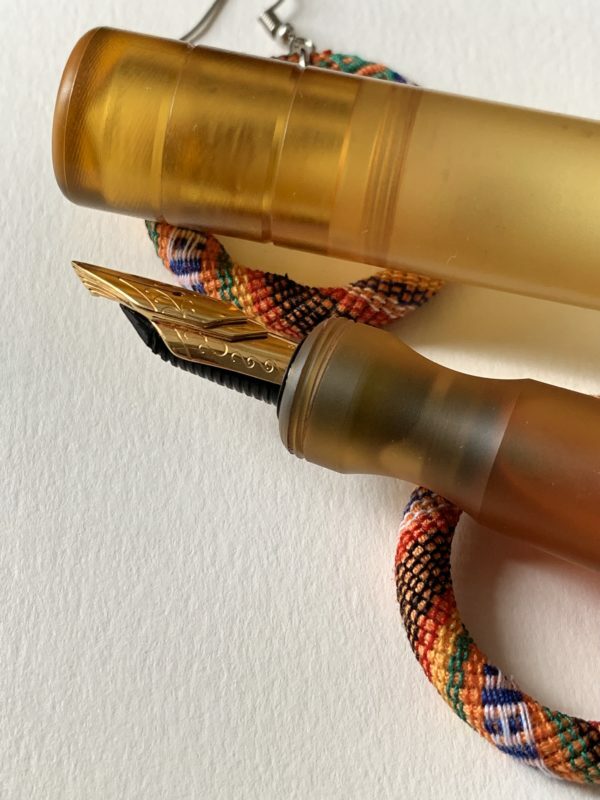 From Mike Masuyama’s famed needlepoint to Jim Rouse’s SIG (Stub Italic Gradient) and Dan Smith’s architect, to the Binder and Mottishaw flex modifications, someone will find something they can’t wait to put to paper. There is much more choice compared to when I started getting serious about fountain pens, over a decade ago. 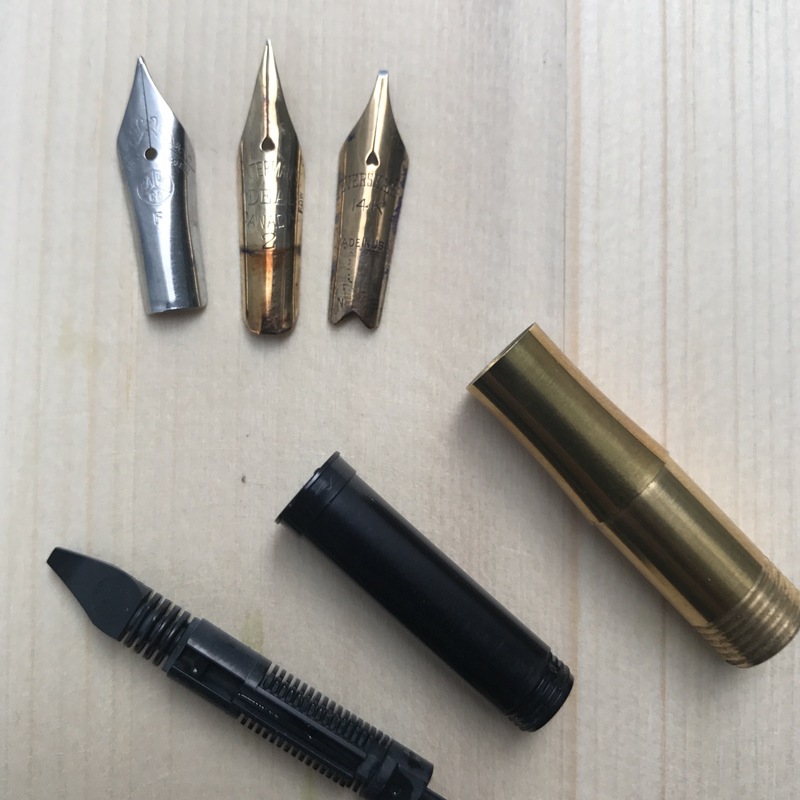 Vintage nibs widen your repertoire and can be surprisingly affordable, especially if you luck into them at pen shows or in a junker lot (yes, those still pop up once in a while) on the ‘bay. 1. Think small. We’re used to size 5 and 6 nibs now, but earlier pens had smaller nibs. In modern pens, those nibs can slide down too far into the collar or section, or are simply too narrow for the feed. I’ve had a pretty good success rate so far with Kaweco Lilliputs. This is a modern Kaweco Lilliput nib beside a Waterman no.2 and an Eversharp flex stub I pulled from a Peyton Street pen. The nib and feed come out of the collar, which unscrews from the section. Check if the nib fits the feed. There should be no gap between the tip of the feed and where it meets the nib. If there is a gap, expect hard starts and irregular flow. Vintage Eversharp nibs seem to match modern feeds. Not always, but a good number. Keep an eye out for them. Another small modern pen that can accommodate vintage nibs is the Franklin-Christoph model 45. Below, one sports a Moore Maniflex, the other a Waterman’s Ideal no. 2. 2. Mind the gap. Earlier feeds were ebonite, and could be heat-set to adjust to the nib. Modern nibs are usually plastic. They can be adjusted with a little heat but only slightly. 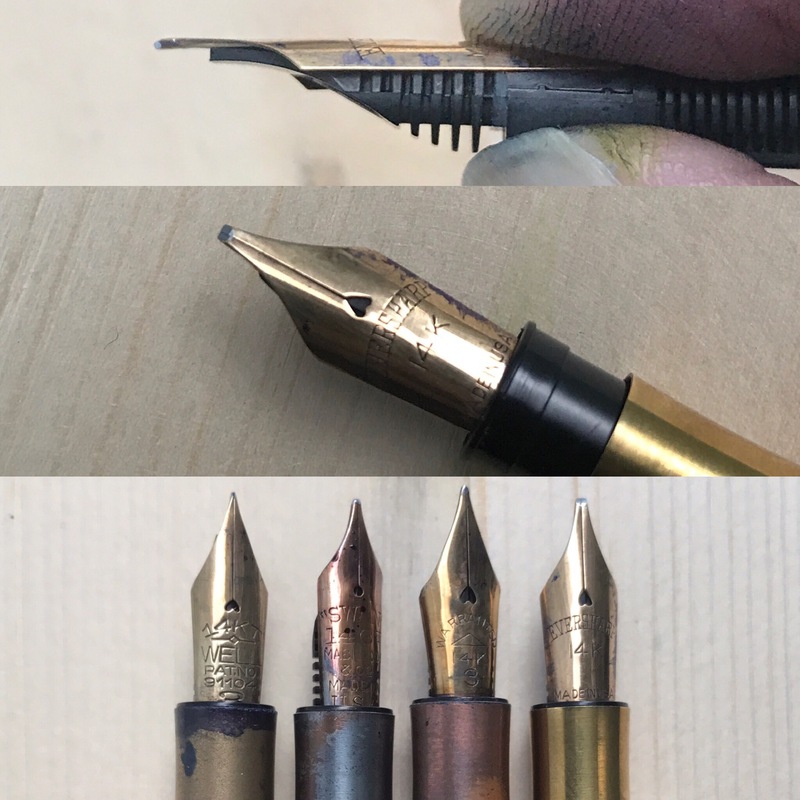 Vintage nibs tend to be more curved than modern ones. When you push a vintage nib into a modern collar, inspect the space between the tines and the tine alignment. A slight mismatch in curvature can put pressure on the tines, causing them to move apart or misalign. This means your pen won’t write. In the image below, the third feed (modern plastic) has been heated and its tip bent upward to close the gap with the nib. That feed belongs to a YStudio pen, which now sports a vintage Waterman nib. 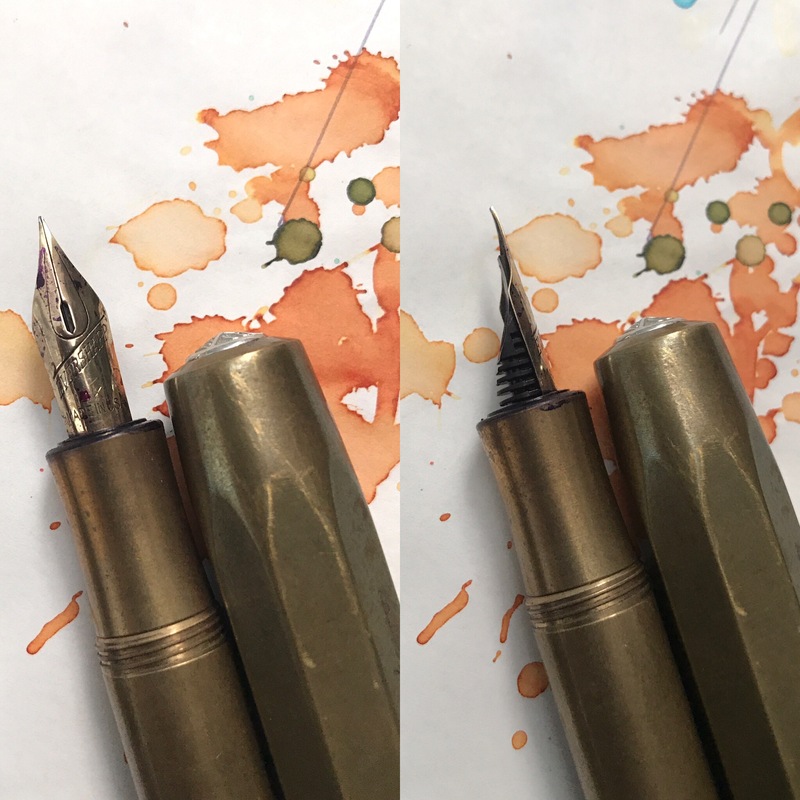 This teardrop Skyline nib fit a Kaweco Brass Sport on the first try. Lucky. 3. Don’t pass up the chance to stockpile nibs. You never know when you’ll find a pen that will finally fit that Swan no. 1 or the Warranted no. 3. 4. Sometimes the fit isn’t ideal. Don’t sweat it. 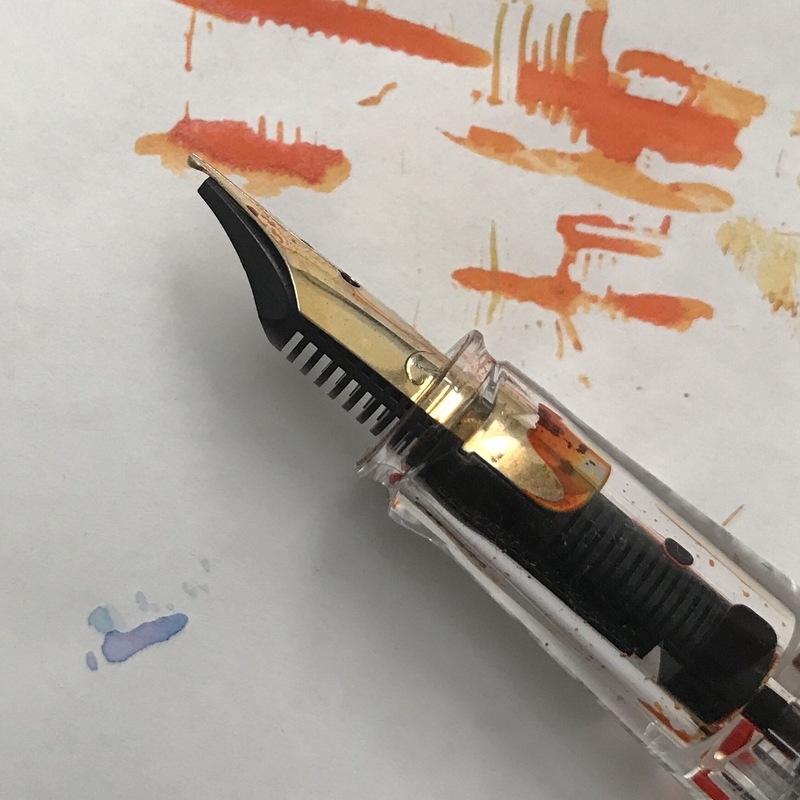 Use the nib in the pen, take it out, rinse it, and store until you need it again. Side note: it was harder to find a nib that would fit the TWSBI Eco. I had in fact thought it would be easier because there was no collar. Oh well. Curvature again. This nib sits too low – the feed will hit the paper at times, depending on the angle that the writer holds the pen. 5. Don’t forget headroom. Vintage nibs have relatively longer tines. There might not be enough clearance between the inside top of the cap and the tip of the nib. If you feel any contact at all, take out the nib and see if you can seat it lower. If you can’t, save the nib for another pen. 6. Don’t force it. You can replace or replicate a modern production pen but not a vintage nib. 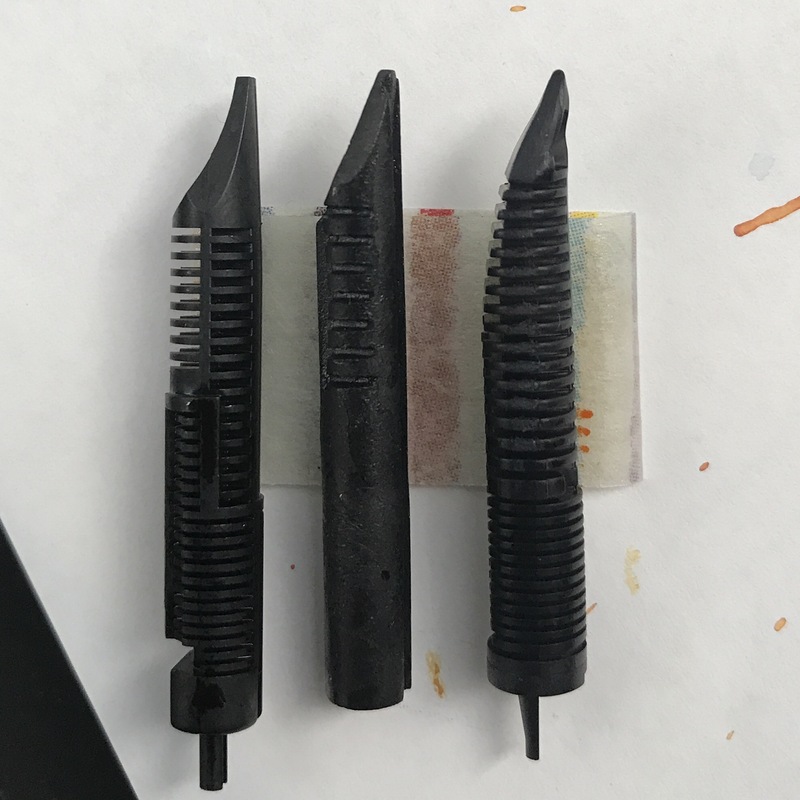 The image below shows an almost match, but it is an almost that will most likely will not work without stressing the nib. 7. 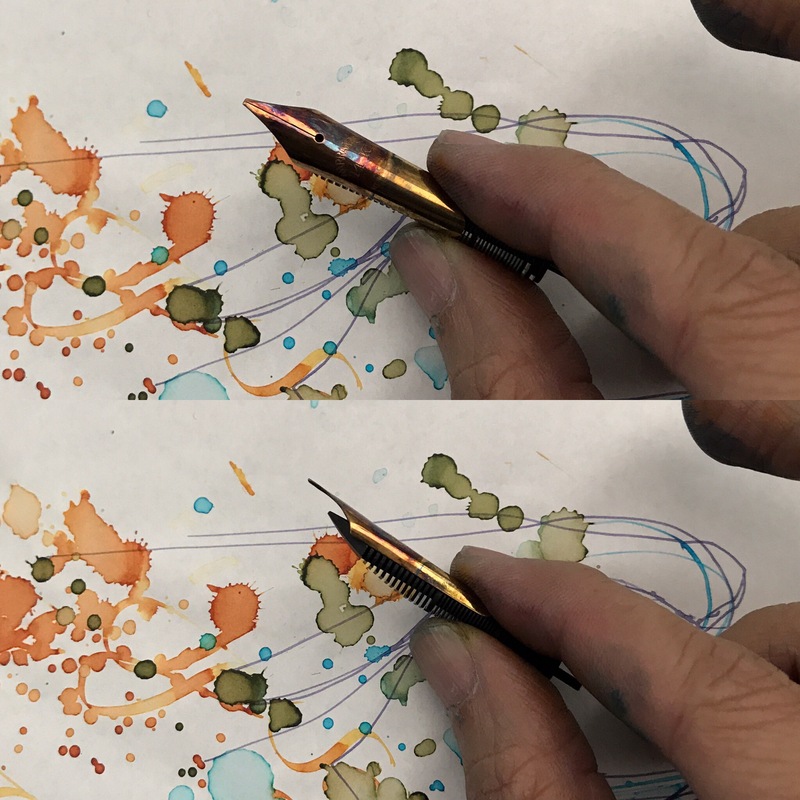 Be sensitive to how the nib behaves over time and with regular use. Check it through a loupe every so often to make sure it isn’t developing stress cracks, and to assure yourself the tines are properly aligned.